With still no word on a special session two weeks after the General Assembly adjourned having failed to pass a revenue bill to fund the full state budget, higher education officials and students alike have begun to worry. On Friday, dozens of students at the University of Maryland urged lawmakers to return to Annapolis and rallied against tuition hikes that would likely result if the “doomsday budget” is implemented. Friday’s rally followed a unanimous vote by the Student Government Association calling on Gov. Martin O’Malley to order a special session. O’Malley has delayed ordering lawmakers back to Annapolis until a consensus can be met on the issues that derailed the legislation two weeks ago. Legislators have until June 1 to reconvene and pass the remainder of the budget package in order to avoid $50 million in cuts to the university system budget that could result in as much as a 13% increase to in-state tuition. Such a hike would be the largest since the Ehrlich administration, which saw tuition increase by about $2,000 over four years. Students who attend the 12 institutions overseen by the University System of Maryland have been plunged into uncertainty in the wake of the budget inaction. Although in-state students have faced cost increases over the years, they have been relatively modest. Under the O’Malley administration since fiscal 2008, tuition for in-state undergraduates at the state’s flagship university in College Park has increased $400, thanks largely to a four-year tuition freeze lifted by O’Malley at the end of his first term. Separate from tuition costs, which are dictated by the legislature and approved by the Board of Regents, student fees are decided at the university level. These mandatory fees vary from institution and go toward a variety of services, such as healthcare, athletics, and shuttle buses. But for students, the technical differences between the two costs are irrelevant — they appear on the same bill. Although student fees at the University of Maryland have seen small increases over the years, they too spiked after the end of the tuition freeze in 2010. That same year saw furlough days for faculty and reductions in aid. Overall, the cost of attendance for College Park undergraduates has increased by about $1,000 since 2008, not counting textbooks, housing and living expenses, which continue to rise. Tokunbo Okulaja, a junior at the University of Maryland who spoke at the unveiling of a doomsday countdown clock last week, said that she and others have been faced with the prospect of losing legislative scholarships as a result of the budget. “It’s unfair to students,” Okulaja said, noting that some students have been forced to drop out in the face of decreasing financial aid. For university administrators, steep tuition hikes are a reminder of an era many wish to forget. Under the Ehrlich administration, tuition increased by 40%, making Maryland colleges the 6th most expensive in the country. That ranking has decreased to around 26th, with universities around the country increasing tuition as state aid has fallen. 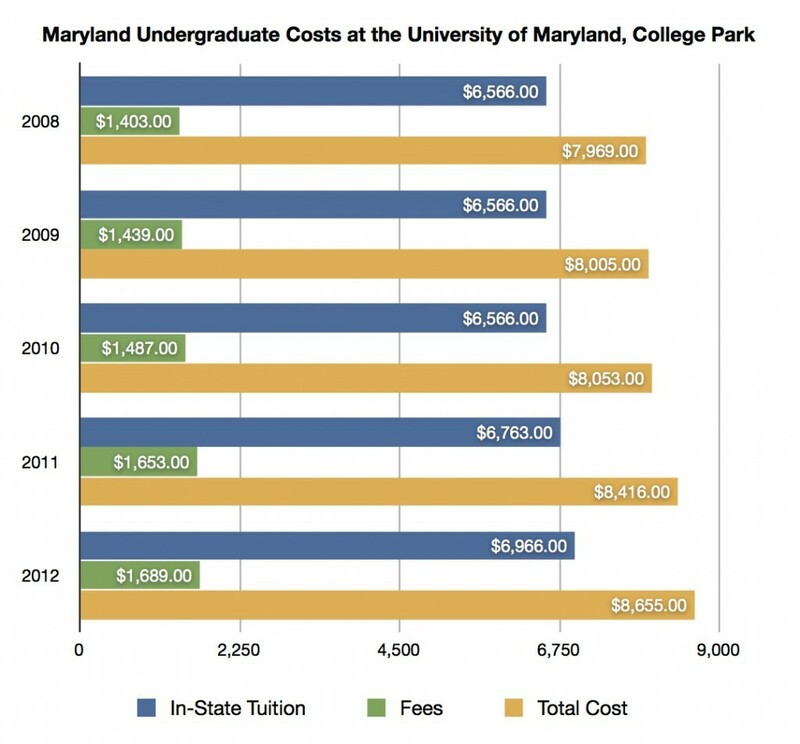 The University of Maryland is often more affordable than public universities in Virginia, Pennsylvania, and Delaware. William “Brit” Kirwan, who has served as chancellor of the University System of Maryland for both Ehrlich and O’Malley, said in an interview Monday that the doomsday budget would not only mean a dramatic hike in tuition of more than $800, but also a reduction in services and fewer classes. Kirwan said he fears Maryland could go down a path similar to California, which in recent years has reduced state funding for higher education by about half in the face of dramatic budget cuts. As a result, public universities established for the primary purpose of serving Californians have been forced to turn away in-state students for out of state and international students who pay a higher tuition rate. O’Malley is scheduled to meet with House Speaker Michael Busch and Senate President Mike Miller over breakfast on Tuesday — apparently the first time Busch and Miller have met since a tense bill signing ceremony the morning after the session ended. Kirwan said he remains unsure what the final product of a special session could be.